Is that a shiny new free agent in your stocking, or an old lump of coal? But before you start thinking playoffs, remember that many big deals don’t work out. Who will be nice and who will be naughty this year? From the list above, Greinke is 29 years old, Hamilton is 31, Upton is 28, and Sanchez is 28. Not many young players are available through free agency, but are these 4 to 6 year deals for 28 to 31 year olds a good idea? I tackled this question with my friend Jeff Phillips for ESPN the Magazine in early October. As the college football season gets under way, my buddy Jeff and I put together a brand new college football ranking for ESPN the Magazine (insider required, in print 9/17/2012). We started with ESPN’s pro franchise ultimate standings as a template, and tried to make things as quantitative as we could to make the ranking defensible. We’ve inspired some feedback already. The SEC does well of course but didn’t land the number one team — check it out if you get the chance! How long has it been? Too long, I think. But Tyler’s recent post has compelled me to withdraw from my self-imposed hibernation and away from the stultifying process of studying for the Ontario bar exam. In short, I disagree with the capitalist/socialist, American Sports/European Sports dichotomy or, rather, I think it abstracts away from the real issue – that cartels make a heck of a lot more money than entities that exist in competition with one another. In short, the NFL and MLB are not staunch defenders of equality values; Dan Snyder and Hank Steinbrenner are not driving the train to the Finland Station. The standard argument goes something like this: isn’t it ironic that America, land of unbridled capitalism, home of animal spirits on free and open fields, has “socialist” sports leagues that redistribute resources from winners to losers while red, socialist, pinko Europe has a free and open market for sports talent? It’s a cute argument and one that elicits a nice “hmmm…” from readers and there are certainly large elements of truth to it. American sports are, at least nominally, more redistributive, and there is a larger perception that American sports are organized more “fairly” than European sports from a competitive standpoint. Still, it’s far from clear that European sports are more aristocratic than American sports if we look at the highest levels and, more importantly, I think this distracts us from a deeper, more thorough comparison of why European sports and American sports are organized so differently. 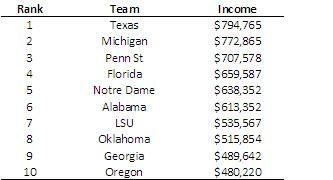 How much money are college football players worth? A few months ago, my friend Jeff and I worked out how much University of Florida athletes are worth to the school for ESPN the Magazine. The key to our approach — in contrast to other studies — is that we looked at profits generated by each player, rather than revenue. Revenue is not so relevant if it is outrun by costs. What matters is profit (before subtracting player compensation). Profit tells you how much schools could actually pay their players. The short answer: the best college football players at Florida are worth millions per year, the best basketball players are worth a few hundred thousand, and all other athletes cost the school quite a bit of money. If you have ESPN insider, you can view the full article online. How much of this profit do football and basketball players see? Very little. 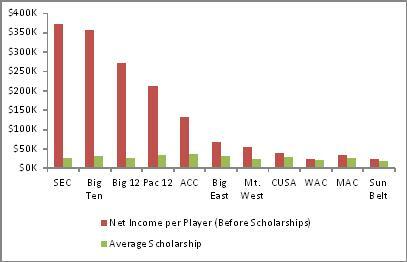 Player compensation in the form of scholarships is between $15,000 and $50,000 per year per player at most schools. By contrast, other athletes are getting a great deal. Not only do they get a free education, but Florida spends tens of thousands more on each player to ensure that they have awesome coaching, facilities, and equipment. The SEC and Big Ten are making over $300,000 per player! It’s no wonder we see recruiting scandals every year. They won’t disappear until schools are allowed to pay players closer to what they are worth. There’s no escaping it. [Barcelona’s] degree of perfection requires an unequal distribution of talent and resources. This concatenated brilliance is probably unjust when measured against nearly any standard of fairness—but it’s also as close as anyone has yet come to fulfilling that specific style of play. FC Barcelona are but one example. For instance, recent Chelsea squads have flirted with perfection of a wholly different style of play. They are no less aristocratic simply because they have refined different aspects of their squad. Their strengths may be different, but they are no less refined for that. Every coat of arms is different—the aristocratic task for each is to live up to their particular identity. Undemocratic though they are, no one will mistake them for ordinary. For whatever else they do to The Game As A Whole (or As A Spectacle), aristocratic clubs elevate the stakes and—more often than not—the peaks of athletic achievement. If Barcelona regularly administers whippings to clubs in La Liga’s middle and lower echelons, their clásico jousts with Madrid have periodically taken both teams yet closer to the pinnacle of sport. Noted left wing crazy Bill Maher got a lot of sports guys fired up last year by using the NFL versus the MLB as a metaphor for the Democratic Party versus the Republican Party and “fairness” versus “unfairness.” Here’s a stereotypical response from Allen Barra in the Atlantic. It’s even being dragged up again this year. A few months ago, my buddy Jeff and I did some research for ESPN the Magazine on paying college athletes. We ignored all the institutional issues and got right to the accounting: considering costs and revenues, how much profit is each player worth to his team? We focused on the University of Florida and found that top college football players are worth millions of dollars, while basketball players are worth a couple hundred thousand. Check out the details on the Sloan Sports Analytics Conference blog or in my previous post.